Chester County Opportunities Industrialization Center (CC-OIC) has opened in Coatesville and has a mission to train the unemployed and underemployed into long-term employment opportunities. Started by Rev. Leon Sullivan over 55 years ago, to meet the employment needs of disadvantaged individuals, CC-OIC offers workforce training and case management services for everyone, including young adults and adults who have been involved in the criminal justice system. In January, Jason Whyte, Senior Director of Operations and Strategy, visited the Latino Coalition of Community Leadership (LCCL) to learn about the work they are doing to help returning citizens successfully transition back into their communities. Both national organizations are contracted by the U.S. Department of Labor (DOL) to provide employment-related trainings and supportive services to returning citizens, through the Employment and Training Association (ETA) department’s Reentry Employment Opportunity (REO). 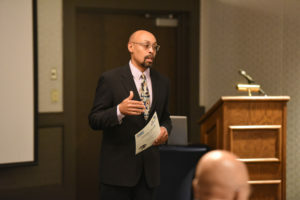 After numerous meetings between Whyte and Richard Morales, Deputy Executive Director (LCCL), over the three-day visit, both organizations discovered that they function with very similar philosophies. Both organizations employ evidence-based and informed practices with a sober understanding that local adaptation is necessary; no one model is fully transferable to all communities. The organizations are also acutely aware that buy-in and commitment from leadership, a team of talented people, a culture of learning, and proper management of data and performance measurement, are foundational for successful reentry programming. Morales introduced Whyte to associates and partners of LCCL, such as Christie Donner, Executive Director of Colorado Criminal Justice Reform Coalition (CCJRC); Johanna Leal, Principal Consultant with the Alliance for Criminal Justice Innovation (ACJI); Leo Alirez, Executive Director of Lifeline; and Hassan Latif, Executive Director of the Second Chance Center. Together, these players are working to slash recidivism in Denver, Colorado. OICA and LCCL will continue to discuss creative and innovative ways both national organizations can partner to tackle this national problem. “We thank the Chester County Commissioners and the county’s Department of Community Development for making this dream come true,” she added. Chester County Opportunities Industrialization Center’s vision is to be leaders in improving the lives of disadvantaged adults by creating educational and employment opportunities. Along with ongoing programs offered by Chester County OIC, including GED, English Language Acquisition and Certified Nurse Aid, the organization’s new SOAR re-entry program — a strategy that addresses the range of challenges faced by formerly incarcerated young adults who are trying to make a successful transition back into their communities — will serve as a resource to youth ages 18-24 in Coatesville and throughout the County. Chester County OIC’s new location is 22 N. 5th Avenue, Coatesville, PA 19320. In 2008, Tri-County OIC created the OIC BookyMobile – a travelling bookmobile for kids and adults. The idea of the BookyMobile started when the OIC executive director realized that many low-income children and their parents did not have access to enough books at home. Schools were struggling to provide books to students and access to libraries was limited to those who lacked transportation and resources.